Start off your visit on the 1st (Sat): don't miss a visit to Lombard Street and then take in the views from Golden Gate Bridge. Keep things going the next day: catch a ride on Cable Cars, take in the waterfront at Fisherman's Wharf, and then step off the mainland to explore Alcatraz Island. 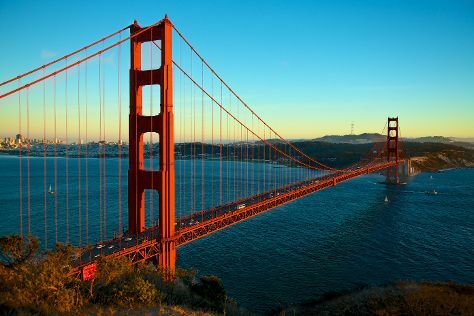 To find reviews and tourist information, read our San Francisco road trip site . Manchester, UK to San Francisco is an approximately 14-hour flight. You can also do a combination of flight and subway; or do a combination of train, flight, and subway. The time zone changes from Greenwich Mean Time (GMT) to Pacific Standard Time (PST), which is usually a -8 hour difference. In June, daytime highs in San Francisco are 25°C, while nighttime lows are 15°C. Finish your sightseeing early on the 3rd (Mon) to allow enough time to travel to New Orleans. Kick off your visit on the 4th (Tue): wander the streets of Garden District, learn about all things military at The National WWII Museum, and then take a stroll through Royal Street. 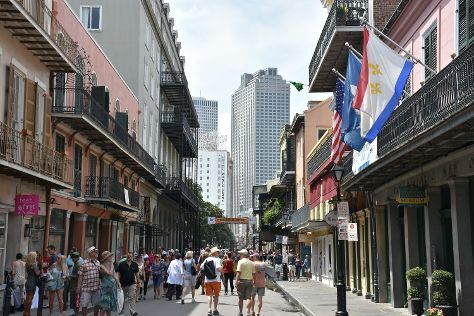 Keep things going the next day: take in the spiritual surroundings of St. Louis Cathedral, steep yourself in history at Laura Plantation: Louisiana's Creole Heritage Site, and then tour the pleasant surroundings at New Orleans City Park. To see reviews, photos, where to stay, and tourist information, read New Orleans trip itinerary planning app . Traveling by flight from San Francisco to New Orleans takes 6.5 hours. Alternatively, you can do a combination of subway and flight; or drive. Traveling from San Francisco to New Orleans, you'll lose 2 hours due to the time zone difference. Traveling from San Francisco in June, expect nights in New Orleans to be warmer, around 33°C, while days are a bit warmer, around 33°C. Cap off your sightseeing on the 5th (Wed) early enough to travel to Sanibel Island. On the 6th (Thu), enjoy the sand and surf at Bowman's Beach and then identify plant and animal life at J.N. "Ding" Darling National Wildlife Refuge. For traveler tips, reviews, and other tourist information, go to the Sanibel Island trip planner. Traveling by combination of flight and taxi from New Orleans to Sanibel Island takes 6.5 hours. Alternatively, you can do a combination of flight, bus, and taxi; or drive. The time zone changes from Central Standard Time (CST) to Eastern Standard Time (EST), which is usually a 1 hour difference. While traveling from New Orleans, expect somewhat warmer days and a bit cooler nights in Sanibel Island, ranging from highs of 38°C to lows of 27°C. Cap off your sightseeing on the 6th (Thu) early enough to go by car to Marco Island. Marco Island is a city in Collier County, Florida, United States, located on an island by the same name in the Gulf of Mexico off the coast of Southwest Florida. Start off your visit on the 7th (Fri): get some thrills out on the water with a waterskiing or jet-skiing adventure, make a trip to Marco Island Center for the Arts, then take a tour by water with Boat Tours & Water Sports, and finally partake in some friendly competition at Xtreme Escape Game. For traveler tips, ratings, maps, and other tourist information, read Marco Island online journey planner . Drive from Sanibel Island to Marco Island in 1.5 hours. June in Marco Island sees daily highs of 38°C and lows of 27°C at night. Wrap up your sightseeing on the 7th (Fri) early enough to ride a ferry to Key West. Eschew the tourist crowds and head to Dry Tortugas National Park and Fort Zachary Taylor. And it doesn't end there: see what you can catch with a fishing tour, steep yourself in history at Truman Little White House, soothe aching muscles at some of the top local wellness centers, and get up close to creatures of the deep with a dolphin and whale watching tour. To see ratings, more things to do, other places to visit, and other tourist information, go to the Key West trip planner . Getting from Marco Island to Key West by ferry takes about 2.5 hours. Other options: drive. In June, daily temperatures in Key West can reach 36°C, while at night they dip to 30°C. Finish your sightseeing early on the 10th (Mon) to allow enough time to take a bus to Marathon. Start off your visit on the 11th (Tue): look for all kinds of wild species at The Turtle Hospital, take in the exciting artwork at Michelle Nicole Lowe Art Gallery, and then cast your line with a fishing tour. Here are some ideas for day two: look for all kinds of wild species at Dolphin Research Center, then take in the views from Seven Mile Bridge, and then immerse yourself in nature at Bahia Honda State Park. Plan a Marathon trip in moments using our itinerary builder. You can take a bus from Key West to Marathon in 1.5 hours. Another option is to drive. In June in Marathon, expect temperatures between 38°C during the day and 30°C at night. Wrap up your sightseeing on the 12th (Wed) to allow time to travel to St. Augustine. SAINT AUGUSTINE | PONTE VEDRA on Florida's Historic Coast The Nation's oldest city (est. On the 13th (Thu), brush up on your knowledge of spirits at St. Augustine Distillery, explore and take pictures at Flagler College, then visit a coastal fixture at St. Augustine Lighthouse & Maritime Museum, and finally don't miss a visit to St. George Street. Keep things going the next day: look for all kinds of wild species at St. Augustine Alligator Farm Zoological Park and then kick back and relax at St. Augustine Beach. To see ratings, other places to visit, where to stay, and more tourist information, read St. Augustine trip maker site . Getting from Marathon to St. Augustine by combination of shuttle, flight, and car takes about 6.5 hours. Other options: drive; or do a combination of shuttle, flight, and bus. Traveling from Marathon in June, plan for little chillier nights in St. Augustine, with lows around 26°C. Cap off your sightseeing on the 14th (Fri) early enough to travel back home.